A carte-de-visite portrait of the celebrated actor Charles Fechter (1824-1879). Charles Albert Fechter was born in London on 23 October 1824, but his father being German-French, he was taken to France at a young age and educated there. He began his adult life as a sculptor, but had a natural inclination for the stage. In 1840 he made his debut at the Salle Molière. Next followed a tour of France and a visit to Italy before he appeared in Berlin. 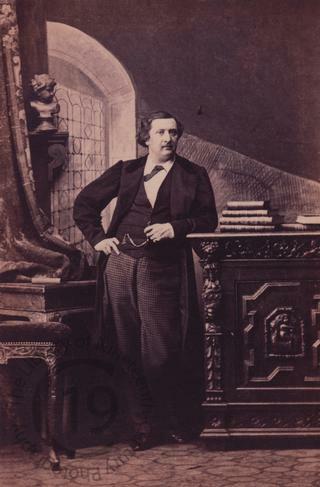 In 1852 he created the role of Armand in the stage adaptation of La dame aux camellias by Dumas fils. He made his London debut at the Princess’s Theatre in 1860 in an English translation of Ruy Blas and the following year astonished theatre goers with his interpretation of Hamlet, which was to become his most famous role and the part for which he is best remembered. He toured the United States, where his audiences were almost as large as his fees, in 1869-1870 and again in 1872, when he decided to make America his home. As a place of retreat he bought a farm at Richmond, three miles from Quakertown, Pennsylvania, where he lived with his second wife Lizzie Price. He became very fat, which somewhat limited the roles he could play. He died on 5 August 1879 after a painful illness. Photographed by Camille Silvy of London on 11 June 1862.